Unlikely as it may seem, our sleepy Wiltshire village has a link to American Civil War and the famous Confederate commerce raider CSS Alabama, in the person of David Herbert Llewellyn, the son of our then vicar, and the Alabama’s surgeon. He lost his life at the age of 26 in the Alabama’s last battle with the USS Kearsarge in the English Channel off Cherbourg. Born in 1837, he was the third and youngest son of the Reverend David Llewellyn perpetual curate of Easton Royal for 29 years, he was educated at Marlborough College and then trained to be a doctor at the Charing Cross Hospital, qualifying in 1859. He signed on as a surgeon on a steamer newly built by Laird’s in Birkenhead, then simply known by its shipyard number 290. It was then equipped as a fighting vessel and named The Alabama after a clandestine dash to the Azores. The vessel was commanded by Captain Raphael Semmes of the navy of the southern Confederate States then attempting to secede from the United States. She followed a sensational career as an armed raider, in which as much by reputation as actual seizures she totally paralyzed maritime commerce of the North and at least to a degree diverted Union naval resources from the blockade of Southern ports. Her voyage took her as far as the Cape Town, Borneo, Singapore and South America. She sank a Union gunboat the USS Hatteras off Galveston, her only naval victim. She claimed a total of 65 merchant prizes valued at 6 Million Dollars – about 90 Million in today’s money. Interestingly in her whole career she never made landfall in the Confederate States. 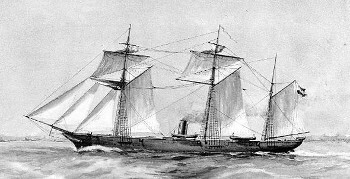 The Alabama was finally caught off Cherbourg by the more efficiently equipped Federal vessel the Kearsage and on the morning of Sunday 19th June 1864 was sunk in a fight that lasted just over an hour. Having been at sea for so long her ammunition had deteriorated and several shells which hit the Kearsarge failed to explode. Llewellyn went down with the ship after refusing a place, which he had a perfect right to take, in the boat taking the wounded men from the Alabama to the Kearsage. The boat was full: he had already prevented another unwounded man from jumping into it. He could not swim and was last seen floating out into the water with an empty ammunition box under each arm. Medical students, doctors and other members of the public sympathetic to the Confederate cause, and the captain and other surviving officers of the Alabama contributed to memorials for Llewellyn. A black marble slab in Easton Royal church with a Latin cross in white marble was designed by W T Hale. At the foot rests a naval anchor and cable with shot of varying sizes. Leaning against the side of the cross is a snake entwined staff – the rod of Asclepius, Greek god of healing and physicians, symbolizing medicine. The letters CS in the four corners are for the Confederate States. The glass in the east window of the church also forms part of the memorial to Llewellyn. Designed by Lavers and Barraud, miracles of healing are shown and two small yellow shields near the top of the window carry black anchors. There is also a tablet to his memory in the Charing Cross Hospital Medical School. Llewellyn's obituary was published in the Dorset County Chronicle and Somersetshire Gazette Thursday 30th June 1864.